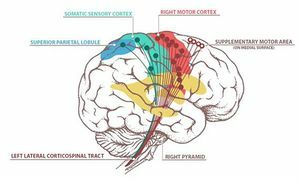 The corticospinal tract (CST) forms part of the descending spinal tract system that originate from the cortex or brainstem (Crossman & Neary, 2015) and is also known as the pyramidal tract. The CST has approximately 1 million nerve fibres with an average conduction velocity of approximately 60m/s using glutamate as their transmitter substance. Lateral fibres (lateral corticospinal tract) are contralateral fibres. These make up between 75-90% fibres. They descend in the posterior part of the lateral funiculus. This tract is detected through to the lumbosacral spine and fibres synapse either directly on anterior horn cells of the contralateral side to their origin (ipsilateral to their side of descent in the spinal cord), or on interneurones of layers within this same side. 30%-40% arise from the primary motor cortex. Rest of the fibers arise from the supplementary motor area (SMA), premotor cortex (PMA), parts of the somatosensory areas (S1 and S2) and parts of the posterior parietal cortex. Due to the various origins that contribute to the CST, it is considered that this tract not only forms part of the motor system, but also has a large sensory role also. These fibers that originate from the sensory cortex terminate in the dorsal horn of the spinal cord where they synapse with interneurons that receive input from somatosensory receptors and are thought to regulate information from peripheral receptors within the spinal cord. Therefore, the CST may act as a ‘gate’, modulating or inhibiting information that is deemed useful or irrelevant (Bassoe Gjelsvik & Syre, 2016). A lesion to the CST can occur anywhere along its path from the cortex to the anterior horn of the spinal cord. 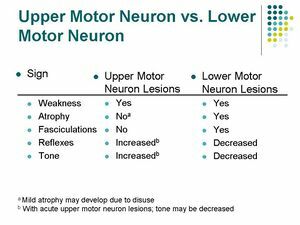 A lesion of the CST typically results in the upper motor neuron signs. A lesion of the CST cranial to the decussation of the pyramids will result in deficits on the contralateral side. A lesion of the CST caudal to the decussation of the pyramids will reslt in deficits on the ipsilateral side. 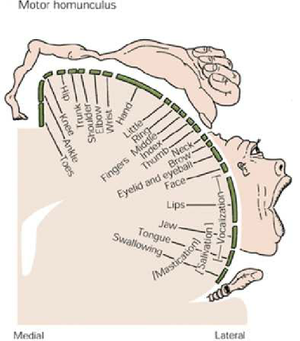 The image below depicts the motor homunculus. Dependant on what aspect of this is damaged will result in motor deficits on the contralateral side of the body. Click here to read more about stroke. Following a spinal cord injury, both voluntary (sensory and motor) and involuntary control can be impaired and the extent of recovery dependent on the severity of the lesion (Freund et al, 2013). As the CST has already decussated, motor deficits will be ipsilateral to the site of the lesion. The ASIA outcome measure, which assesses both motor and sensation, will provide an indication of the level of the spinal cord lesion and whether or not it is complete or incomplete. Crozier et al (1991) concluded that 89% of those who were ASIA B-E with pinprick preservation went on to ambulate. This is due close proximity of the spinothalamic tract to the lateral corticospinal tract and their shared blood supply. Learn more about spinal cord injury. The effect of a lesion to the CST causes more than just muscle weakness. It also affects synergistic movement patterns that affect things such as dexterity, ambulation and activities of daily living. evoked potentials in affected upper limb or the Asymmetry Index (measured with diffusion-weighted MRI) they were able to predict whether there could be a complete- no recovery. It was suggested from these finding that clinicians using the PREP algorithm may be able to predict the likely extent of upper limb recovery and may be able to therefore manage of patient expectations from an earlier period. Following a lesion to part of the corticospinal tract, such as a stroke, their function is impaired resulting in contralateral motor deficits. Although people begin to experience motor recovery to some extent, complete recovery is rarely achieved. It is believed that during these activities that axonal remodelling may not only happen in the lesioned cortiospinal tract, but also the corticorubral tract from the ipsilesional hemisphere as the rubrospinal or the reticulospinal tract. It is thought that these deep brain areas provided support for the CST. ↑ Crossman, A.R. and Neary, D. (2015). Neuroanatomy. An illustrated Colour Text. 5th Edition. Churchill Linvingstone. ↑ Welniarz, Q., Dusart, I. and Roze, E., 2017. 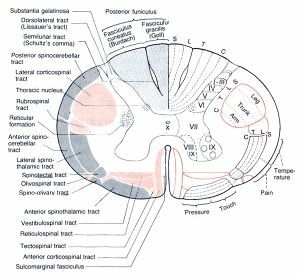 The corticospinal tract: Evolution, development, and human disorders. Developmental neurobiology, 77(7), pp.810-829. ↑ Shumway-Cook, A. and Woollcott, M.H. (2007). Motor Control. Translating Research into Clinical Practice. 3rd Edition. Lippincott Williams & Wilkins. USA. ↑ Bassoe Gjelsvik, B.E. and Syre, L. (2016). The Bobath Concept in Adult Neurology. 2nd Edition. Thieme Publishers. Germany. ↑ Freund, P., Curt, A., Friston, K. and Thompson, A., 2013. Tracking changes following spinal cord injury: insights from neuroimaging. The Neuroscientist, 19(2), pp.116-128. ↑ Stinear CM, Barber PA, Smale PR, Coxon JP, Fleming MK, Byblow WD. Functional potential in chronic stroke patients depends on corticospinal tract integrity. Brain. 2007 Jan 1;130(1):170-80. ↑ Stinear CM, Barber PA, Petoe M, Anwar S, Byblow WD. The PREP algorithm predicts potential for upper limb recovery after stroke. Brain. 2012 Aug 1;135(8):2527-35. ↑ Okabe, N., Narita, K. and Miyamoto, O. (2017). Axonal remodeling in the corticospinal tract after stroke: how does rehabilitative training modulate it?. Neural regeneration research, 12(2), p.185.